Beautifully engraved Certificate from the National Oil Products Company issued in the 1950's. This historic document was printed by the Mamilton Banknote Company and has an ornate border around it with a vignette of two men on both sides of the company logo. This item has the printede signature of the company's president and is over 57 years old. We have not seen many of these certificates around. 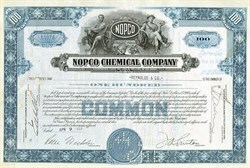 NOPCO Chemical merged into the Diamond Aikali Company who shortly thereafter merged with The Shamrock Oil Company to form the Diamond Shamrock Corporation in 1967. The company changed its name to Maxus Energy Corporation in 1987.